These tasty garbanzo bean burgers are quick, healthy, and cheap. Served with either a nice green salad, or a bun with salsa or mayo, they make a nice main meal or party snack. Plus my little one will eat them so that’s always good! They’re oven baked too, not fried in fat (even though you could!). Place garbanzo beans in the bowl of a food processor with bell pepper, carrot, garlic, red chile pepper, cilantro, tahini, salt, and pepper. Place the lid on the food processor, and pulse 5 times, then scrape the sides, and pulse the mixture until it is evenly mixed. If the mixture looks dry, add olive oil. 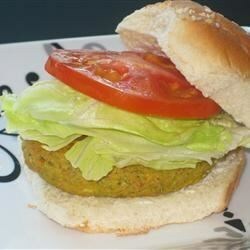 Refrigerate garbanzo bean burger mixture for 30 minutes. Preheat an oven to 350 degrees F (175 degrees C). Prepare a baking sheet with parchment paper or lightly grease with cooking spray. 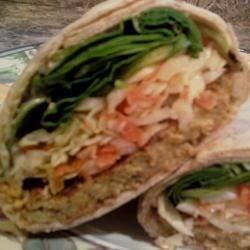 Shape the chilled garbanzo bean burger mixture into patties. Bake 20 minutes, then carefully flip burgers and bake 10 more minutes, or until evenly browned.